The Ostroy Report: Another Swiss Cheese Gore Denial that Leaves the Door Wide Open for 2008. Who's He Kidding? Why give the vermin on the right two full years to plan a campaign to smear and discredit Gore as they did before - with the help of the corporate media? There's plenty of time. Keep the opposition guessing. They're focusing on Hillary - believing she'll be the candidate. Al is playing it cool this time. He owes no one a commitment right now. He's doing just fine at this pace, - building a great deal of respect and admiration and recognition from many unlikely sources - all of which are unconnected to a run for the presidency....and are accolades for the man himeself, - not the cartoon they made him out to be. I completely agree with peacemom. What's the hurry? Let the repulsicans go broke bankrolling bogus testimonials screaming about Hillary. The average man on the street doesn't even know who the current vice president of the country is...ever watch Jay Leno? A couple of people asked thought Hillary was already vice president. We blue states need alot more company in the form of grassroots counterparts in the "purple" states before a full out draftgore movement can get legs. His movie is just coming out. The masses have yet to weigh in nationally. During the summer, who pays attention? Only us political junkies. Then, the DVD will be out in the late fall if not Christmas and it will necessitate a new round of Gore interviews to promote the added "special attractions" to the DVD....by then it'll be close enough to '07 and bush's poll numbers will be in the single digits. The dems will be lining up behind the one person in this country that belongs in the White House.....can't wait! I too greatly admire Al Gore. He has the Beltway contacts and pro-corporate reputation to gain the DLC's support and make a successfull run for president. 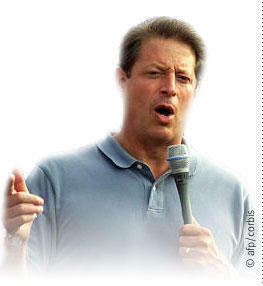 Ya know, I'm not sure exactly what it is I admire most about Al Gore. Maybe it was the deciding vote for NAFTA. Maybe it was bullying the South African government to stop buying cheap AIDs drugs on behalf of his friends at Pfizer. There's just so much to choose from! I suppose AlanSmithee would like to vote for Ralph Nader again so we can all Hail another Republican President in 2008. Al Gore and the DLC long ago came to a parting of ways - it happened the moment he said he had concluded that we need a single-payer health coverage system, and it has only escalated since then. When he stood up against the invasion of Iraq, he made it absolutely solid. Everything he has done since then has mapped out the territory. I'm surprised at you, Alan, I thought you knew this! But, Andy, you're wrong, too. I'm with peacemom, there's no hurry for Gore to declare, and in the meantime, we have to do more than blog about it. If there isn't a visible groundswell of support, he can't run. And first we have to make clear to the Democratic leadership that we have no patience with their screwing around this time - we should be browbeating them to get behind him now instead of supporting Hillary, who is sucking all the air out of the process. We should also be writing nice, polite letters to people like Frank Rich (as well as idiots like Broder) and asking them if they understand that the reason we support Gore is that he's the right man for the job. But people absolutely have to get involved with their Democratic Party locally and with the party nationally and make the ground ready for the game. Millions of isolated opinions amount to nothing if no one is fighting the establishment to make it happen. And the last thing we need is so-called supporters complaining that Gore is too "coy" or disingenuous, playing right into the RNC script. Gore is stating a fact: Unless there is overwhelming support, he is in no position to stand for office, and that's what he keeps telling you. If you can't hear it, that's your problem, not his. I can read between the lines as well as anyone. Gore is saying that he would run for the presidency if he could feel the wind at his back. He doesn't feel it yet, and that means no candidacy. You don't like it, you have to turn on the wind machines, not carp at Gore. LOL, Gore/Hillary, can you imagine the looks on the Repugs faces in the Senate with Hillary as Leader of the senate! Makes me ROTFLMAO! To be a fly on the wall of the senate chambers! Damn that Ralph Nader! This is all his fault! Why, if it weren't for that damn arab SOB, 9/11 would never have happened! It's true! I heard it on Al Franken and Huffpo - so it must be true! Oh, if only St. Gore had won! 9/11 would never have happened and we'd all have universal heath insurance and free college tuition and candy would fall from the sky while happy frou-frou elves dance in the streets. But Noooo! That evil awful Ralph Nader had to spoil everything! He stole our votes! And caused the Iraq War! And ring-around-the-collar! And Battlefield Earth! It's all Nader's fault! It's true! I read it on Daily Ko$!!!! I voted Nader and feel good about it. I couldn't hold my nose and vote for the guys that sold American industry down the drain. The stench was and still is too great. The Democrats feed from the same troth as the Repugs. I would definetely vote for Obama. Only problem is he'd probably get assinated. Too good to be a president. Tell the whole truth Alansmithee, the author of NAFTA was George Herbert Walker Bush. The republicans like to blame all of this on Clinton & Gore but it was Bush who authored NAFTA & had already signed agreements with Canada & Mexico. Clinton tried when he took office to fix NAFTA by side agreements to have fair labor & environmental practices. Al Gore was right on Iraq before the war started, he was right on airport security before 9/11 & he is right about big oil & global warming. If you want a Manhattan project to remove our dependence on foreign oil & you like American jobs then Al Gore is the man for the job. Gore will restore the checks & balances which will help to restore world peace. DON'T ROCK THE YACHT! BUSH/GORE IN '08! NAFTA cleared the Senate by one vote. Al Gore was called in to perform his constitutional role as Senate President to cast the tie-breaking vote in favor of the treaty. Clinton and Gore, through Gore's tie-breaking vote, delivered what Bush I could only dream of. Thus began the precipitous hollowing-out of American manufacturing. The Clinton-Gore passion for "free" trade agreements such as NAFTA, the WTO, and GATT greatly accelerated the pace of exporting the American manufacturing base in ways that backers of their Republican predecessors could only dream of. The massive negative impact of these agreements on American workers was immediate, but was largely masked by the growth (both real and speculative) in the IT sector. It also took a few years for the full for the full intensity of the changes to be felt as the transition phased-in.